A set of eight slamming action scenes to colour – on cool A4 posters that you can stick up on your wall! Join battling boy hero Ben 10 as he faces down monsters and aliens. Colour each eye-popping scene as he fights and morphs between bodies. The colouring pencils are included, as well as reusable stickers – but YOU have to add in the excitement! 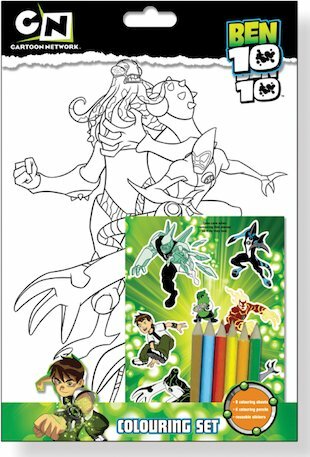 Contents: eight A4 colouring sheets, reusable stickers and six colouring pencils.